← Will Adjustable Height Electric Tables Become the Norm? As an executive member of your company, it’s important to have a work-space that supports the various vital responsibilities you carry in maintaining the success of the business. Since an executive desk will likely be the centerpiece of your personal office, it’s important to make sure that you’re content with one that works specifically for you and what you do. Style, features, size, and material are all key elements in making that match possible, but they are also major influences on desk cost. Being familiar with them means you don’t have to spend gobs of money in order to work at an executive desk that feels like an executive desk. The first major factor in the cost of your executive desk includes style and features. Executive desks are commonly built in a traditional style, often conveyed through wood finishes, decorative trim, and a number of storage features. Today though, with a sleeker no-frills look, the contemporary style is gaining in popularity as well. Ultimately, these considerations are based on the nature of your company and your work. Storage features often come in the form of drawers, which are usually vertically stacked in the traditional pedestal style and sized for various types of contents. Cubby holes, shelving, and cabinets, and even an attachable hutch are other storage features. Having a lot of storage space may be nice to have, but adding features can greatly increase the cost of your executive desk. While this might be perfect for more conservative firms that still handle a lot of paper documents, if your workday consists mainly of a computer on a work surface, then aside from maybe a keyboard tray, there’s really no need for all that wasted storage space. This can also be said of the overall shape of your executive desk. Deviations from a rectangular desk include L-shaped and U-shaped desks, and though they might look less boring, they can be a waste of extra money if you don’t require much work surface to complete daily office tasks. If you’re looking for a little extra room for your executive desk without spending a lot of money or taking up floor space, a bow desk is an attractive option. If your private office is the site of occasional impromptu meetings, the lightly convex curve that runs the front length of your bow desk offers a welcome for discussion. Opting out of decorative accents such as wainscoting, moldings, and edge trim can also help to keep cost low. Because of its impact on the materials required to build it, the size of your executive desk will be another factor that influences cost. The work surface area of a typical executive desk is 60 inches wide by 30 inches deep, but many executive desks are often larger and grander than that. There are other ways that you can make a statement with your desk without crowding your office or throwing away money on the wasted work surface. Thirty inches is in fact considered by some to be the upper limit of useful desk depth, with any more than that being mainly used for display items such as nameplates. Even a depth of 24 inches—which is also the minimum desk clearance at foot level while sitting—can provide you with an adequate work-space. Materials are yet another consideration in the cost of executive desks. Solid wood is no doubt a beloved material for most traditional executive desks due to its air of elegance and warmth. It provides a polished appearance to your desk while also delivering in terms of durability. However, for many businesses, the high cost of solid wood means this is just not a doable option from a budget standpoint. Just a single pedestal-style desk with a 30” x 70” work surface can be as much as $5,000! One cost-efficient alternative for your executive desk that may be worth looking into is MDF and/or particle board. In order to reduce their products’ overall costs, furniture manufacturers often use particleboard (also known as low-density fiberboard) and the stronger, denser MDF (medium-density fiberboard) to construct the under-layers, drawers, and non-visible paneling that help to make up the piece of furniture. These two materials can also be called “composite materials.” Instead of being harvested, these materials are factory-created though a variety of pressure methods. This results in boards for your executive desk that can be specified to a particular density or thickness. The major advantage in these alternatives to wood is that they’re much less costly and can be engineered with a consistency in material and density that you’re not likely to find among natural-occurring materials. This could be a likely choice when you’re looking for the right executive desk for you. As you can see, there are many ways in which an executive desk can be designed and built, but it’s important to know how certain aspects of construction influence cost. Familiarity with these points leads to the wiser decision of a desk built specifically to facilitate the crucial tasks of your workday. 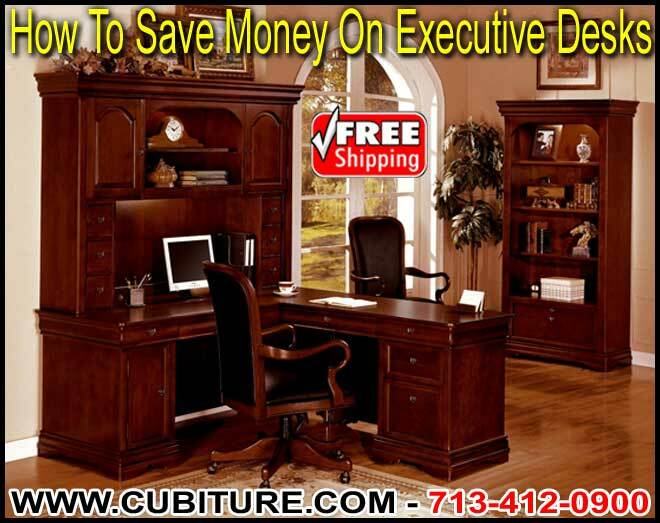 Call us at Cubiture today to discuss how we can provide you with an executive desk that’s perfectly tailored to your office needs!